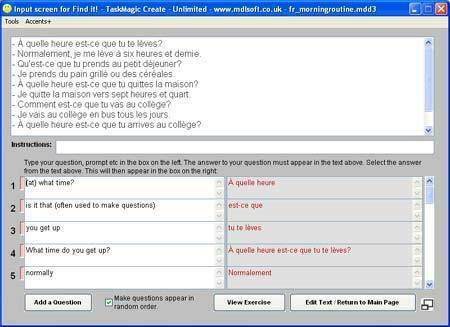 In a previous post (see here), I discussed how it was possible to exploit a source text to generate a whole range of interactive exercises and worksheets based on the text itself, as well as on the lexical items within the text, and how this can be achieved in a matter of minutes using TaskMagic3. This post will take a quick look at how short transactional or situational dialogues (or any short series of exchanges on any topic) can be exploited in a similar way, using the Dialogues component of TaskMagic3 as the starting point. You can either type in the dialogue line by line or use the "Quick Input" tab and paste it in from elsewhere. The lines of your dialogue should not include the name of the person who is speaking, otherwise these names will also be included in your exercises. Alternate lines of the dialogue are assigned to persons A and B. This is an optional step, but it will give you access to a range of extra resources, and it is a really useful exercise in itself. Select a target word or phrase from the dialogue and then type in the prompt for this word or phrase. You can type prompts in English, for example, to find TL words or phrases in the text. Look at the exercises you have created so far. Click here to open the Dialogues page on the TaskMagic website, with lots more information about the files available. 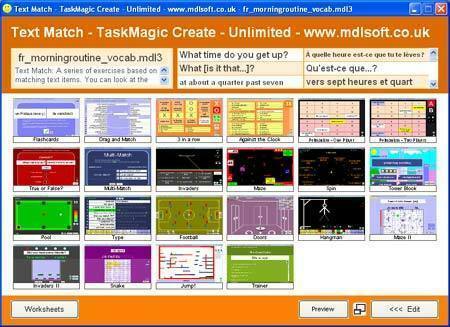 So far you will have created the 9 interactive exercises on the above menu screen: Line Jumble; Half Lines; Word Jumble; Gap Dialogue (with 3 levels of difficulty); Space; Click & Fill; Anagrams; Word Guess; Find it! The worksheets are automatically generated based on your dialogue: Line Jumble; Half Lines; Word Jumble; Gap Dialogue 0; Gap Dialogue 1/3; Gap Dialogue 2/3; Gap Dialogue 3/3; Space; Anagrams; Find it! If you want to use your questions and answers from the Find it! exercise as the basis for a series of exercises practise and reinforce these lexical items, see the next step. 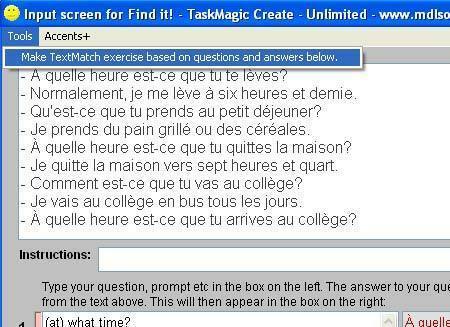 Click here to open the TextMatch page on the TaskMagic website, with lots more information about the files available. The Text Match exercises: Flashcards; Drag & Match; 3 in a Row; Against the Clock; Pelmanism 1 Player; Pelmanism 2 Players; True or False? ; Multi-Match; Invaders; Maze; Spin; Tower Block; Pool; Type; Football; Doors; Hangman; Maze2; Invaders2; Snake; Jump! ; Trainer. 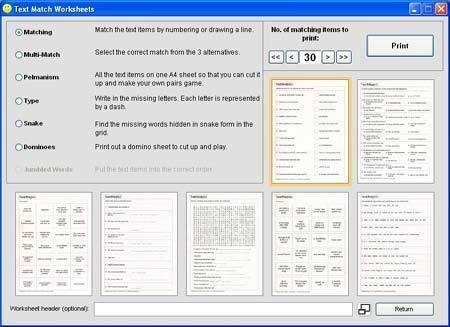 The worksheets are automatically generated based on your matching items: Matching; Multi-Choice; Pairs; Write; Snake; Dominoes; Jumbled Words (available if the interactive version is made available). By default, when exported to Mix&Gap from Dialogues, the file is saved with a limited range of exercises available, as some of the exercises which are less suited to working with text on separate lines have been de-selected. You can modify this selection using the check boxes in the bottom left of the screen, to make more or fewer exercises available. It's a good idea to create a gap-fill exercise based on the dialogue in Mix&Gap, as this is so easy to do (just click on the words to be gapped) and gives you access to the Gap-fill worksheet. Click here to open the Mix and Gap page on the TaskMagic website, with lots more information about the files available. 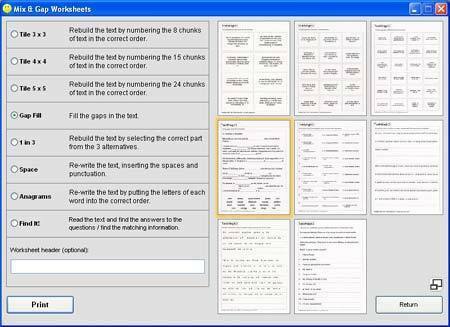 Some of these exercises are similar to those offered in the Dialogues file. e.g. Space (but now the text is in one block and you have to click to put it onto separate lines); Word Guess; Anagrams; Click&Fill; Find it! But you also gain access to a few extra exercises: 1 in 3; Gap-fill; Text Mix; Next Letter 1; Next Letter 2; Tower Block; Next Word. 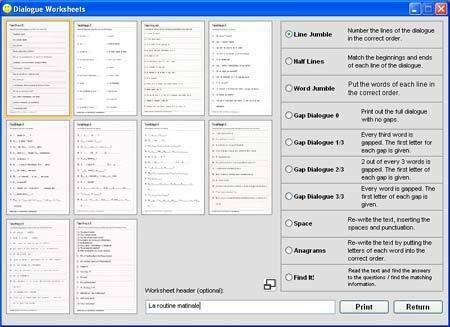 The new worksheets available as a result of exporting the file (i.e. not counting those already available in Dialogues) are: 1 in 3; Gap-fill. So, as promised, loads of interactive and printable resources, based on a few minutes' work inputting a short dialogue and some "find it" prompts, plus a few extra clicks here and there.